This site has been stuck in a rut for quite a while, with broken images and all sorts for a couple of years after the import from Wordpress. I’ve now gone through everything, added missing projects and images, and recategorised things… it should now be pretty complete. There are a few things still missing - downloads for older projects mainly, and a details for a few odd projects - but the most interesting bits and pieces should be here now. Where possible, things have links to SoundCloud where I put most of the music, and to either my own GitHub repo or the Arcade Badgers GitHub repo where there is source available. It’s been an interesting year for me in general. A lot of ups and downs. Starting with the downs first… both kids had their appendices removed at the start of Summer - within three weeks of each other. I swear you cannot put odds on that. So that meant they were stuck inside in what turned out to be a rather glorious Summer for a change. Not long afterwards however, Claire’s grandmother passed away… and not long after that again, Loki passed away - to which I posted about below. We’ve also still been fighting with the debt, with another magic bill pulled out of HMRC’s thin air. On to the good, however. While the debt has been a pest, we’re getting through it.. with the hope of being completely clear of the lot of it by the end of the year! Hurrah! I’ve also found time to work on a few projects, from JS1K with Pollute at the beginning of the year, through to LowRezJam with Pixel Beard and JS13k with -link> just this month. Also, YoYo released the Nintendo Switch export for GameMaker Studio 2! Or the Open Beta anyway, with the final to be done soon-ish. So, it’s been an interesting year.. and it’s not finished yet. The idea is to do another odd experimental thing, and then finally (FINALLY) finish off Snake-A-Roid 2.0 as I’m slowly getting tired of it. There’s not much left to do, but it’s in that last 90% complete stage, where everytime you get to 99%, you find something else that needs done and pushes it back another week of real dev time.. and the Badgers is a side-hustle after all so time isn’t always available. But here’s hoping it sneaks out before the year’s end.. it is looking rather good. Loki passed away this Summer. It was quite unexpected, as he was “the old boy” having been with us for six years! We were sure he’d outlast everyone as he just fought through everything. He had arthritis, which cost a bit in keeping him medicated every day.. but you’d do it for any person, so why not your pet? Still part of the family, just perhaps a bit furrier! But yes.. six years as part of the family is a long time. He outlived his companion, Thor, as well as Ragnarok and Magni. He was piggy number one. He went through our original cage; where both him and Thor were free-range piggies, able to leap out and follow us as they pleased - raiding the salad drawer of the fridge when we opened it. He got the joy of the custom built CNC cage, along with loft with Thor. He got to meet Ragnarok, Cupid and Magni. He soaked us during bath times, by shaking and running around as no, he did not like it! He let his presence be known as we got in the door, and the wheeks for food and attention. He chewed the bars to bits to let everyone know that Loki was boss. He was Claire’s pig. A fact he made perfectly clear by just tolerating me, but scrabbling to her everytime he was picked up. He was a gamer pig - and routinely cuddled down with Claire for gaming goodness - and trying to help by “testing” the analogue sticks for tastiness. He was best pig. There won’t ever be another like him. Six years of Loki. Six years of memories. Six years of showing us what a Guinea Pig can be, and certainly not going down without a fight. He’ll be back with Thor, causing mischief along with Ragna and Magni. Eating all the parsley they can, and forever keeping a watchful eye on me, and a loving eye on Claire. When Thor passed, Loki went into himself and that’s never good for a guinea pig. So, we quickly got him a new friend - Ragnarok - who sadly passed just a few days afterwards. Since we already knew that Loki had to have a cage mate, we went looking for another one; and somehow ended up with two. Cupid and Magni. Magni was a rescue pig. 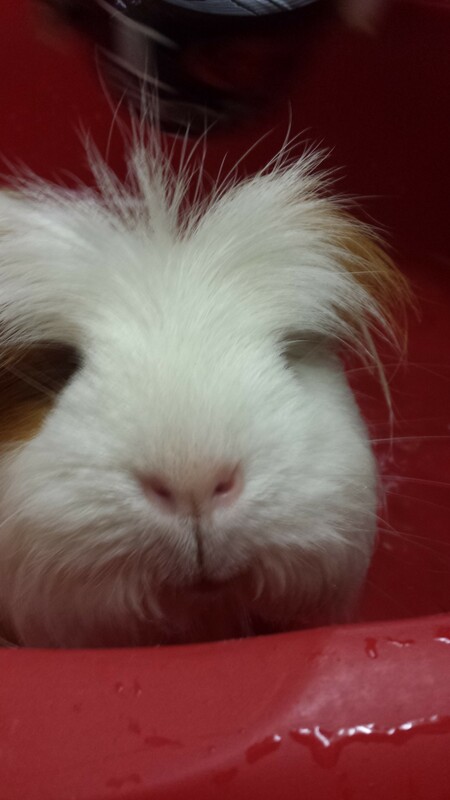 His previous owners had given him up for adoption citing “lack of personality” though more likely, as he was a long haired piggy, was lack of effort on his owners. He was in need of a haircut and a bath when we got him; bathtime being something he came to love! We had almost three years with him. Throughout that time we pretty much came to the conclusion he had a few things wrong with him. He was deaf, to begin with. When fireworks were let off, both Loki and Cupid would hide, whereas Magni would bounce about - obviously feeling the rumblings in the floor and enjoying that - and hearing nothing of the explosions. He may have also been partially sighted as he very much relied on sniffing your hand to know who you were. If you were feeding him, you had to make sure he sniffed your hand, or you’d give him a bit of a shock when he turned round and sensed your hand there. Finally, he likely had heart problems, as there would be occaisions of him “hooting” … though typically, would stop when we went to check on him. Contrary to his adoption reason, he was full of character. Much like Thor, Magni did things in his own little way. He would pile up the hay and then proceed to dive through it, frequently being found in the morning underneath a large pile of it. Being a long hair, he needed a haircut every now and then… he wasn’t too pleased at this in the beginning, but grew to accept it - especially since he usually had a bath first. 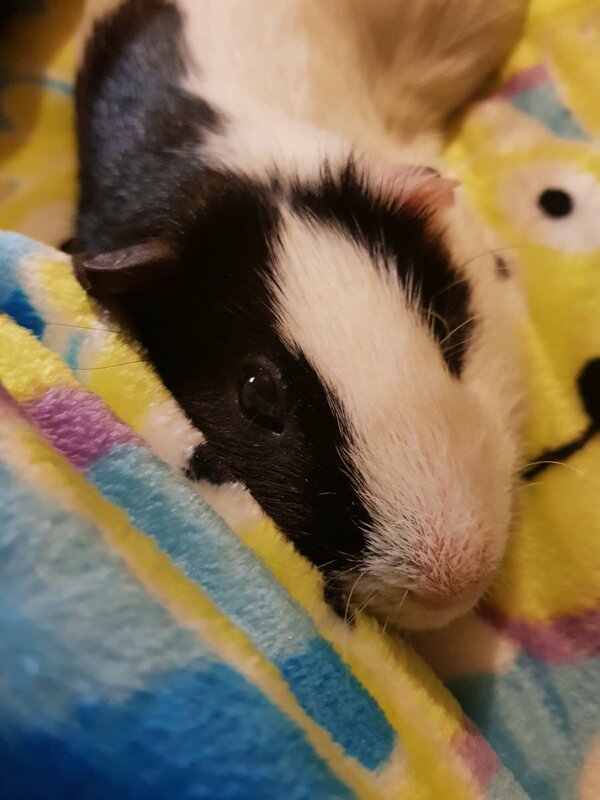 Of all our piggies, Magni was the only one that throughly enjoyed the bath. He’d even attempt to swim in the basin, all smiles and chirps. We have no idea what happened to him. The night before he passed, we noticed he was making a strange sound and was drooling a lot - thinking he’d chipped a tooth from his over eager drinking from his bottle ( he never quite figured it out properly, and would always chew it to bits ) so were going to take him to the vets in the morning to see about getting it fixed. We cleaned him up and he got a bit of a blow dry - smiling all the time and loving the hot air as usual. Unfortunately, as morning came, he was hiding in his pigloo, and couldn’t move. When I picked him up, he felt so limp and fragile. While we rushed him to the vets as quick as we could, we had already known by that point there wasn’t anything that could be done. So we had to say our goodbyes. For a guinea pig with a “lack of personality”, Magni did pretty well for himself. He had a few issues, but took them in his stride up to the very end. Always having a cheeky face, and sometimes being a bit of a mad possessed mop when needing a haircut. Whether his heart problems finally caught up with him, we don’t know. But he’s at peace now, and likely with Thor and Ragna, and having all the baths he wants.